Happy Monday y'all! Part of me can't believe it's Monday again but the other part of me definitely can. Although Monday isn't my favorite day, I'm excited for the next couple of weeks to go by. Originally when Chris and I discussed painting our house, he said it would take no time at all. Well, painting quickly turned into sanding, spackling, sanding some more, sweeping, sanding even more and well, sanding some more. Yes, we spent the entire weekend sanding the kitchen cabinets and baseboards in the whole house. I know it's going to look fabulous when it's all done... done being the keyword. The designer inside of me is just dying to see the finished product. I can't wait to put my furniture (or lack there of) in the house and start buying accents to pull it all together. I finally decided on paint colors, gray being the overall with a navy blue wall in the dining room and a rust(y) color in the sitting room off the entry. Eek! I can't wait! I have yet to decide exactly what I want to do in the entry though. I know I want to do a wallpaper, but do you have any idea how many are out there?! A ton. I'll just say it's way easier selecting a wallcovering for work, but when it's your own home... it's difficult. On that note, today I decided to share some of my first thoughts when thinking about the entry wallpaper. Since the rust(y) color is right off the entry, I kind of want to keep the colors more muted. Or do I? Do you see what I'm doing to myself? While I love the different shades of gray, I definitely don't want the space to be too gray. Feel me? Ugh, I'm struggling. One of the girls I work with told me about spoonflower.com. Let me just say, I'm in love. There are a ton of wallpapers that I love, I can hardly narrow it down. I've only shown a couple below, but you should check out that website. They aren't limited to wallpaper either. They have fabric, bedding, etc. Go check it out. Anyway, enough of my rambling, I'll finally share what I'm liking so far. What are your thoughts? Are you loving any of these? Should I keep it more simple or go bold? I'd love to hear what you're thinking. 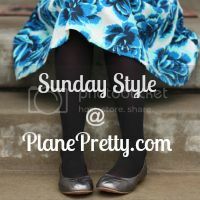 As always, I've linked up over at Plane Pretty with some other great bloggers. Stop by to see what everyone is up to this week.